Thanks to the aisles of pool toys being replaced by blue capped pens and vast assortments of binders, it seems that although the heat may not leave us anytime soon, summertime is wrapping up. Brayden and I had a conversation last night about this, and we both agreed that while we were excited about first grade starting soon, the fact that summer is coming to a close is a bummer for a variety of reasons (his was that he can no longer sleep in. I feel like my work on earth is finally done now that he admitted that sleep is, in fact, a good thing). 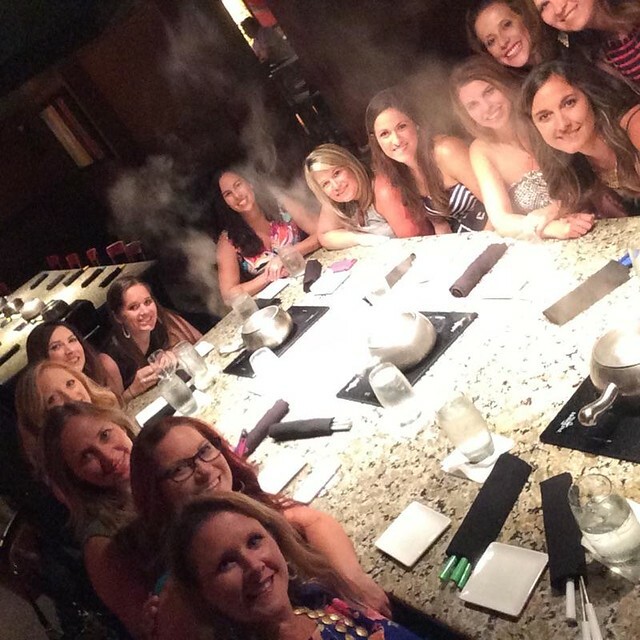 I was able to get away with a bunch of my girlfriends this past weekend. We chose Kansas City as our destination this summer. I have to say, I think it's my favorite. It provides a wide arrange of things to do (since our group is so big, this is kind of vital), has a TON of great eating options (we ate SO SO well. Like queens, I tell you) and is relatively close to where we live, making it a good weekend getaway. I'm so grateful to have such a great group of friends. It's a little bit of a travesty that I brought my big girl camera and used it all of zero times on the trip. Turns out, lugging a giant piece of photographic equipment when it's 100 degrees outside tends to be quite an unwanted task. So I just didn't take any pictures at all. Though, I do have to say that having a selfie stick amongst the group allowed for group pictures ala phone camera, and came with a few laughs from innocent bystanders. Unfortunately I missed my first big milestone of Braydens. 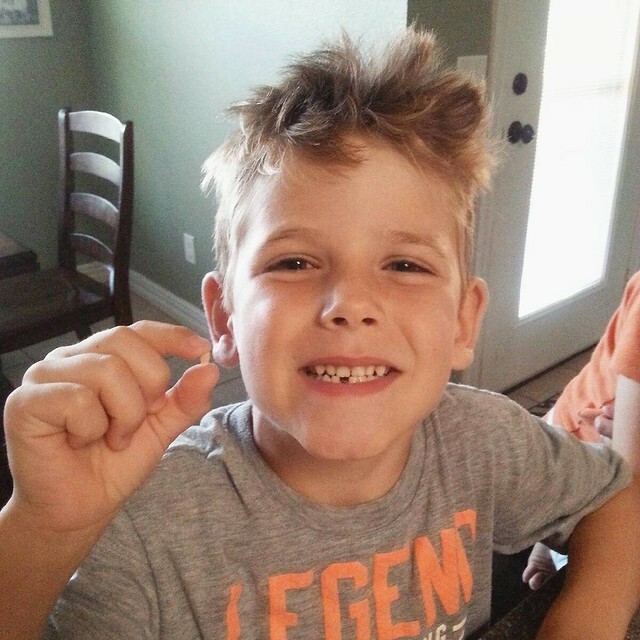 His first loose tooth had been rather dangly lately, and it was suspect to come out soon. I had hoped that Brayden wouldn't muster up the courage to pull it before I got home. But alas, the twisting happened and we had one happy boy that evening beaming with pride at his new loss. Drew did great at covering as the tooth fairy. I'm now trying to decide if I should keep the tooth. I'm not much of a keeper... unless it's a handprint (I'm a sucker for the handprint. Thank you, teachers, for feeding my obsession) it almost assuredly goes in the trash. Be warned: if you run into us, this boy will show off his gap with the greatest of pride. And last but not least, I have to tell you a cute story. Yesterday morning I took my older two to get haircuts. We go to the same person every time because I am OCD and have a weird thing about hair being perfect (or as close to perfect as you can get). Anyways, our stylist was talking to Brayden about stuff and Brayden happened to mention that sometimes he likes to wake up at 6am (I realize this is contradictory to his sadness about school starting and not being able to sleep in. He is a creature of many options and habits, some of which contradict each other greatly). She kind of gasped when he said it, and then he said "yeah, but I like to do that because when I wake up at 6am, my daddy is awake reading his Bible and then I can read it with him." MELT ME. I'm so grateful to be married to a man who leads so well. Here's to our last few weeks of summer... may we spend them well.